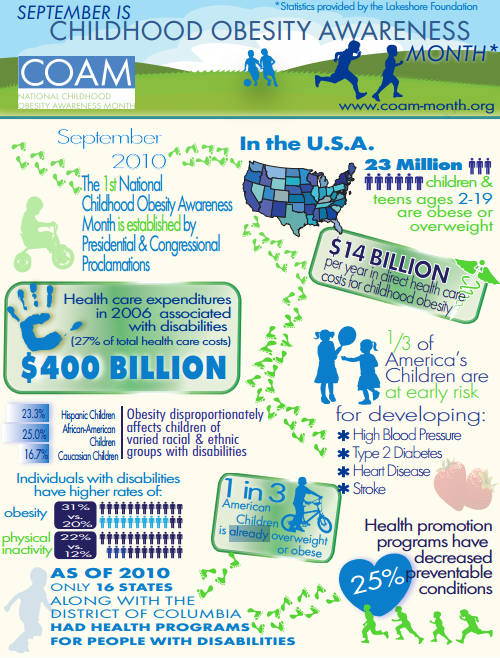 Childhood obesity has increased more than fourfold among those ages 6 to 11 years old. More than 23 million children and teenagers in the United States ages 2 to 19 are obese or overweight, a statistic that health and medical experts consider an epidemic. Food portions are out of control. Portions have increased in both restaurants and at home. Healthy habits start at home. The best way to fight or prevent childhood obesity to is get the whole family on board with a healthier lifestyle. The most effective way to influence your children is to lead by example. Children love to mimic adults. If your child sees you exercising, eating a plate full of vegetables and limiting your time with electronics, they're likely to do the same. When you cook: Cook healthily in front of your children. Better yet, give them an age-appropriate job. Tell them about what you are making and why it’s good for your body. Encourage healthy eating habits. Make breakfast a priority. We all know breakfast in the most important meal of the day. It not only helps to rev our metabolisms in the morning, but studies have shown that children who eat breakfast perform better in school than those that don't. Be cautious about eating out and be smart about sweets and snacks. You don't have to ban sweets, but limit them and introduce fruit-based snacks and desserts instead. Keep snacks small (100-150 calories). Don't let an after school snack turn into a meal. There are no easy options when it comes to tackling childhood weight and obesity problems. However, you can make a huge impact on your child's health by paying attention, making changes for your family, leading by example and being involved with the details of their lives. Baby steps as outlined above can turn into total lifestyle transformations that will benefit your entire family and encourage a lifetime of healthy choices.